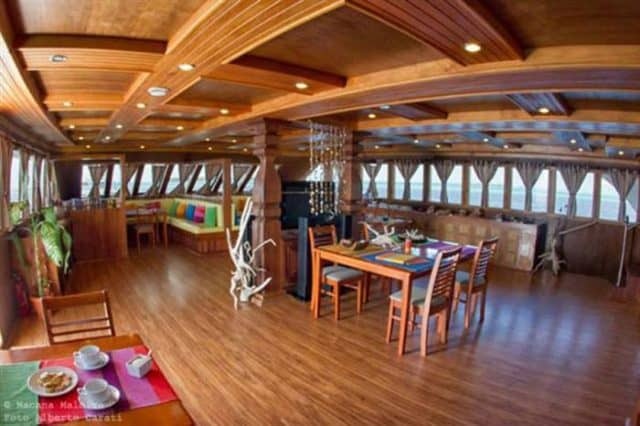 The 35 meters Princess Rani is a liveaboard operating in the Maldives. Indeed, the luxurious yacht was built in 2008 and cruises around the best of the Maldivian atolls. The Princess Rani can welcome up to 22 guests on-board but is also considered fully booked at 20 guests. Indeed, there are 10 lavish cabins on-board, most are doubles (7) and a few (3) have a third single bed option. 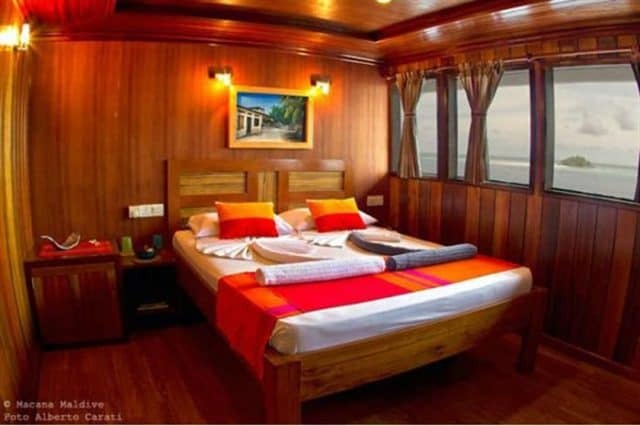 Options are rather limited for twin occupancy as there are only 3 cabins with separate double and single beds. Moreover, each cabin comes with a lot of space, air-conditioning and a private en-suite. You can check the availability and prices for this bat here. The Princess Rani displays an incredibly spacious central indoor lounge, which can also be a dining room. Indeed, it’s roomy and inviting with a choice of cozy booths and tables where divers can gather in small groups. There’s a fully stocked bar in the corner of the room where you can get refreshments through the day and a choice of cocktails, beers and wine after the diving is done. Moreover, you’ll find a centrally located entertainment unit with TV, music and DVD options to chose from. Furthermore, as you walk outside, you will find even more space where to hang out. Indeed, the outdoor space offers both large areas where everybody can get together but also more private space where smaller group can have a private time. 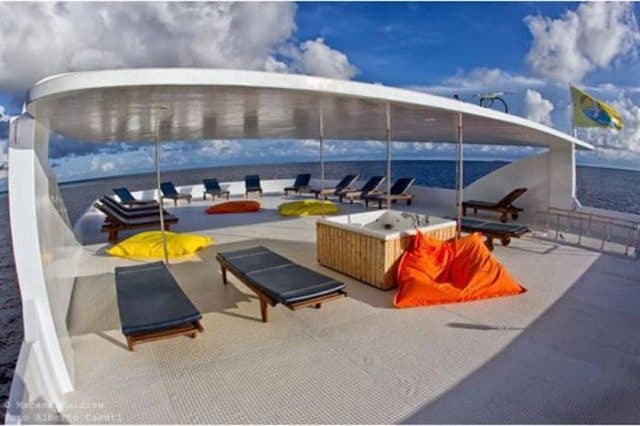 The top sundeck is huge and features plenty of cushioned loungers, cozy bean bags and even a jacuzzi. It must definitely be a customer’s favorite as it also provides the best view of the Maldives! Plus, the actual dining room is the outdoor one, allowing you to enjoy the view even more. First, the luxurious dive boat is fully equipped with all the communication, navigation and safety technologies to insure a safe voyage. Secondly, among the crew of 13 which will take great care of you, there will be 3 scuba diving professionals leading the operation. You’ll be discovering the renowned atolls of the Maldives in safe hands! Finally, the luxurious accommodations did not compromise the scuba diving facilities in any way! You’ll enjoy 3 dives each day and find everything you need on the dive deck and on the dhoni! Prices vary depending on the time of the year. 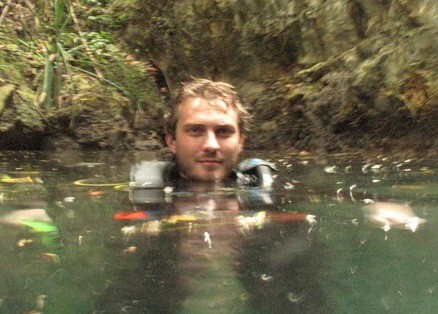 Great Drift Dives, amazing place for underwater photography. Good chance of spotting Manta Rays and Whale Sharks! If you have been diving on board this liveaboard dive boat in Maldives, please share your review and let us know what you thought. Please post your comments in the review section below, by doing so you will help fellow divers to plan their next diving trip . No Liveaboard Review yet on this page, please comment if you have been on the Princess Rani cruise. 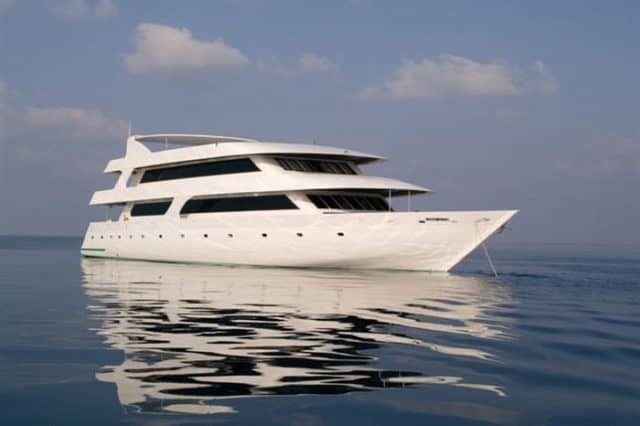 The MY Princess Rani is a luxurious yacht sailing the Maldives and certainly up for some great scuba diving!